Day 10 of 30. The Replacements. – 30 Day Detox… What?? Day 10 of 30. The Replacements. Wow! Day 10! I just realized I’m 1/3 of the way through this thing! It’s pretty exciting. My shakes today are kind of the same. The usual suspects. Dinner was great! I can’t remember the name of it at the moment. 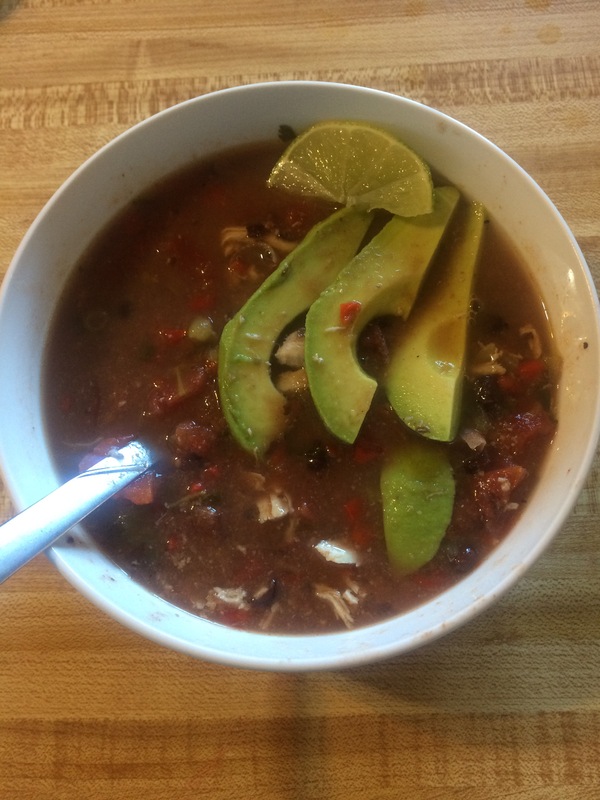 It was like a chicken tortilla soup minus the tortilla. Instead, we added avocado slices and squeezed lime in our bowls. Will definitely make this one again. I thought I’d spend today’s post talking about the stuff I can’t eat and what I’ve replaced it with. Bread. Well, sadly, there’s just no replacing it. There are gluten free breads out there, maybe some of them are even Arbonne Detox-friendly. I imagine it would be something like chewing on cardboard, so I’m not really tempted by it. Crunchy stuff. I love crackers. You can usually find Ritz, Cheez-its, Triscuits, and some other kinds of crackers in my cabinets. I’ve had to say good-bye to most of that, but I’ve been able to replace with brown rice chips. I understand they don’t sound very interesting, but they’re surprisingly good. I also eat roasted almonds. Chocolate. This should be a painful subject (I think it was my first love), but the Chocolate Protein Shake Mix zaps the craving. I imagine I’m drinking Mounds bars when I mix shakes up with coconut milk. White Potatoes are replaced with sweet potatoes or brown rice. I’ve never been a huge fan of brown rice, because of the texture, but it hasn’t been too bad. I actually think I didn’t cook it properly before, because the rice we’ve been eating has tasted very similar to white rice with only a slightly different texture. Pasta. Brown rice pasta texture and taste is not far off from wheat-based. What IS different is the cooking. The first night we made this, the water it was cooking in was so starchy! It looked like wallpaper paste, and when a little hit the counter, it seemed like the consistency of it too. Or snot. It definitely could have been mistaken for a sneezed gone awry. You have to be careful to stir it every couple of minutes too. The starchiness makes the pasta stick to the pan. Peanut Butter is replaced with almond, cashew or sunflower butter. Of the three, sunflower butter or sunbutter, is the least expensive and tastes the closest to peanut butter. For my local yocals, you can get this at Tops stores or Wegmans. Coffee. This is a tough one for me. I once told my son, as we sat outside the Starbucks drive-thru window, “That’s what Heaven smells like. I know it.” I love the smell of coffee beans, and brewing coffee. To get the same pick-me-up, I use Arbonne Energy Fizz Sticks. It’s not the same, but I’ll take it. I have replacements for most things, but it’s been a sacrifice. I’m very focused on healing, so I’m not missing things quite as much as I may have otherwise. I don’t feel like I can afford to cheat; if I were in it primarily for weight loss, I would have already. I know myself. If I could offer any advice for this detox, or any other “thing” you’re doing, it would be to establish new routines, which become new habits. If it’s a habit, it’s not hard to stay on track. Previous: Previous post: Day 9 of 30. Staying the Course. Next: Next post: Day 11 of 30. Moving Day Fun.